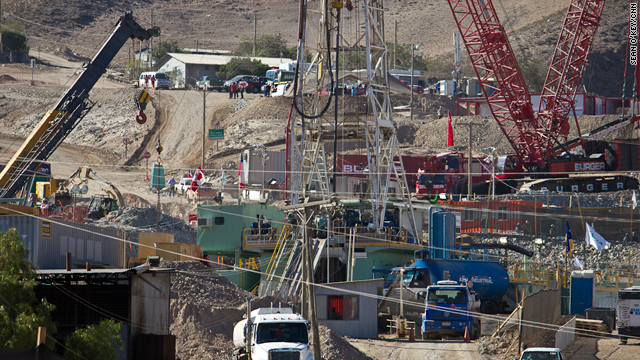 Copiapo, Chile (CNN) -- By Wednesday afternoon, rescuers had winched to the surface more than half of the 33 miners trapped in a northern Chile gold and copper mine, and the world marveled at a "mission incredible." After 69 harrowing days, the miners ascended to freedom one by one, hoisted through a half-mile of rock in a rescue mission that began in the numbing chill of a desert night and continued under the searing sun of a cloudless day. 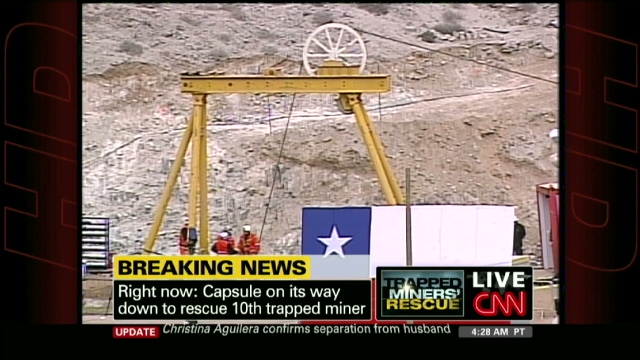 As they came out of the earth in a red, white and blue capsule, the miners signaled a thumbs-up. Or waved Chilean flags. One even led the crowd in a chant for Chile. Some dropped to their knees and prayed. Mostly, though, they embraced the families they feared they would never see again. Chilean President Sebastian Pinera called the mission "magical." U.S. President Barack Obama called it a "tremendously inspirational story." 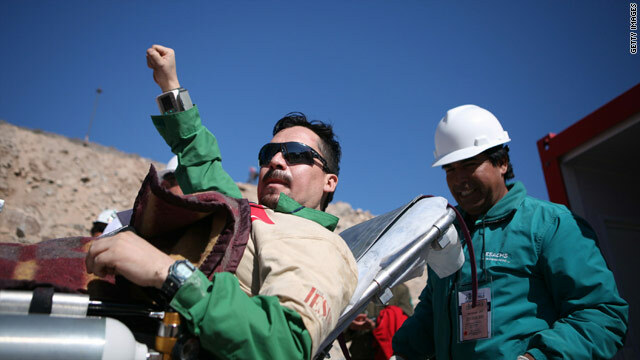 Florencio Avalos was the first to step out from the "Fenix" capsule, named for the mythical bird that rose from ashes. He beamed as his feet touched the surface of the Earth that had smothered him. He cradled his son and wife before Pinera bear-hugged him. The entire night passed before it was Mario Gomez's turn. He is 63 but has been mining since the tender age of 12. He contracted lung disease during his career and lost three fingers in a previous mining accident. He had planned to retire but went back down in the mine August 5 to test drive a new truck. His wife, Lillian Ramirez, stood by nervously as he emerged before her in a cage no wider than the span of his shoulders. Gomez, a man who used to tell his wife to quit bugging him to say daily prayers, dropped to his knees to praise God. At that moment, she knew how lucky she was to have him returned to her. 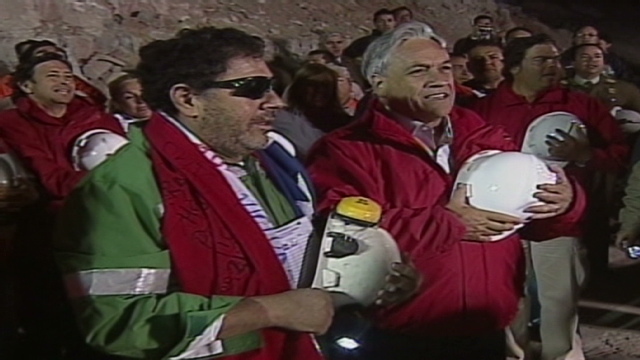 To say there were 33 trapped in the mine is wrong, Ramirez said. There were 33 men -- and God. Ramirez was just one of the many anxious family members who bit their lips in anticipation and then rejoiced at the appearance of each man at the San Jose Mine in Chile's Atacama Desert. The miners had been trapped in the bowels of the earth since August 5 when the mine caved in. In the capital, Santiago, hundreds wept and embraced as they watched the rescue on a flickering big screen TV set up in a square. Corks popped and champagne flowed at the Chilean embassy in Washington. The scene repeated itself as more and more miners arrived. Around the world, strangers sat glued to their television sets. "I mentioned on Twitter how 41 years ago the world watched men walk on the moon," said Connie Preti of New York. "Today we are seeing men come out from the earth. It's equally striking." Pinera greeted each man as he came out of the capsule and said he would remain at the site until the last man was out Wednesday evening. "We had promised to look until we found them," Pinera said. "We can all feel proud to be Chilean." Health Minister Jaime Manalich said the rescue was proceeding according to plan and "going extraordinarily well so far." He said the miners were generally in good health. "We have had very, very minor problems," Manalich said. As the second miner, Mario Sepulveda, exited the rescue hole, he reached into a large yellow bag and handed out what appeared to be rocks to officials and rescue workers. Sepulveda cracked jokes and led the crowd in a cheer for Chile. As the 40-year-old was hauled away on a stretcher for medical evaluation, he asked his wife, "How's the dog?" Later, in a video conference, he said his time underground changed him. We had promised to look until we found them. We can all feel proud to be Chilean. "I buried 40 years of my life down there, and I'm going to live a lot longer to be a new person," he said. "I think I have learned a lot of wonderful lessons about taking the good path in life. For those of you able to call your wives, or your husbands, do so." Avalos, the first man out, appeared strong, walking without help, embracing many of the rescue workers who witnessed his arrival. He was then put on a gurney and wheeled away for an examination by doctors. "I'm overwhelmed with emotion because it's been so long since we have seen him," Alfonso Avalos, Florencio's father, told Chile's TVN. "I'm very proud of him. Thanks to God he got out and looks good." Amid the sea of Chilean flags greeting the emerging miners was a collection of small, handheld Bolivian flags for Carlos Mamani, the lone Bolivian miner. His family back home was restrained in their emotions for much of the morning while watching the rescue on TV. But they jumped up and clapped when they saw him kneel on the ground. Next up was the youngest of the lot: Jimmy Sanchez, an 18-year-old who worked as an environmental assistant -- and the father of a newborn girl. The 12th miner to be rescued, Edison Pena, was no longer "All Shook Up," as the Elvis Presley song goes. An Elvis fanatic who led the trapped miners in sing-alongs, Pena, 34, looked fit and exuberant. He waved and shook hands and hugged colleagues, loved ones and dignitaries. And so it went Wednesday, and so it will go throughout the day. The trapped miners put on green coveralls made of moisture-resistant material and personalized with their names. 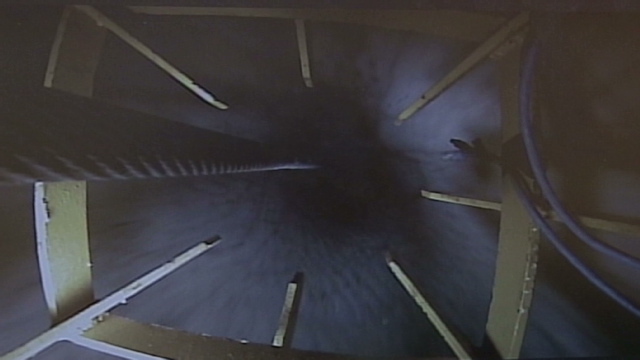 Each climbed into a claustrophobic capsule equipped with communications equipment and a supply of oxygen. Each wore special $450 Oakley goggles to protect their eyes -- which had become accustomed to the vampiric darkness of the caved-in mine -- from the lights up above. Then they awaited the order to hoist to begin their journey. The first miners to come to the surface were deemed the most fit, but also possessed the most technical know-how so that they could advise the rescue teams. The next five were the physically weakest, a term perhaps not appropriate for anyone who has survived more than two months in the bowels of the earth. But one of the miners has diabetes; another has black lung. All of the men are going through two hours of health checks at a field hospital set up at the mine. They will then be flown by helicopter to a hospital in the town of Copiapo -- approximately a 15-minute flight. "It's extremely exciting for us. ... It's a very emotional moment for us," said Jeff Hart, one of the lead drillers who assisted with the rescue efforts. "We worked real long and hard on that, and to actually see the capsule come through the first time through the hole that we drilled was just unbelievable." For the 33 men, the only contact with the outside world since August 5 was through a small bore hole through which they were sent food, water and other supplies. A letter sent by one of them said they would take a vow of silence, to never to fully reveal the details of their underground misery. High above the miners, family members and 1,500 journalists from 39 nations held their collective breath as the rescue mission continued throughout the day. And as each trapped man emerged safe, they exhaled.